We ride Anstey's TTRC213V-S at MCN's Cadwell Park trackday. Fast group, please. 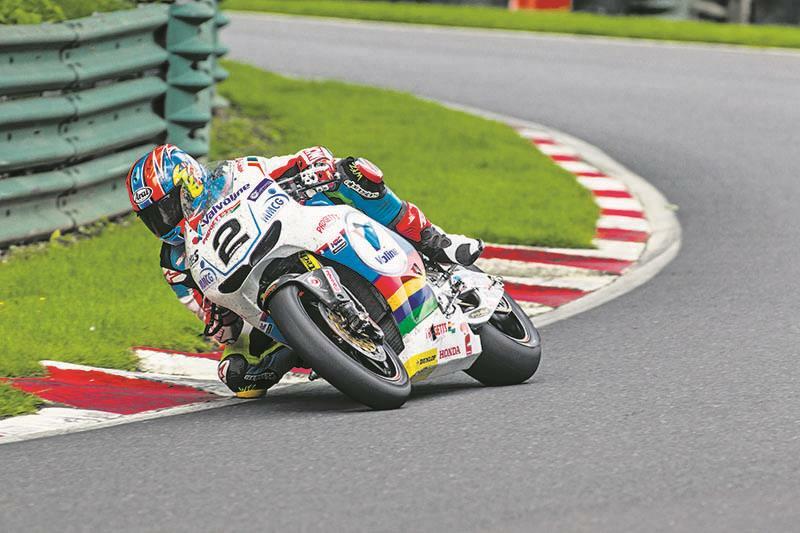 ounding like a strange mash-up between a factory 500 GP bike and a bumblebee on acid, Bruce Anstey’s Padgett’s RC213V-S TT racer spits, snarls and screams along Cadwell Park’s start-finish straight. With its nose still bloodied with Manx flies, it’s a job to see through the tall screen. I might not have much of a view ahead, tucked under the bubble, but with the throttle hard against the stop the Honda is music to my ears. It’s a finely-tuned, high-speed V4 MotoGP orchestra – all bass induction, heart-pounding midrange and brain-tingling treble high notes. It echoes gloriously around the perfectly manicured Lincolnshire track, bouncing off trees, and for the next three laps I’m the conductor. Anstey’s RCV sounds just as angry off the throttle, spearing towards turn one like Marquez’s Repsol Honda. He’s set the electronic air-bleed system to maximum, so the Padgett’s missile gurgles and growls on the overrun, freewheeling to meet the apex, like a two-stroke. The last time this front Dunlop slick was used in anger it was skimming the air along the Glencrutchery Road at the end of the Senior TT, but now it’s biting hard into Cadwell’s magical tarmac. Out of Coppice and up through Charlies, I’m back on the throttle and all 215bhp is ready to be unleashed. An orange symbol on the full-colour dash blinks to show the traction and anti-wheelie systems are disabled. 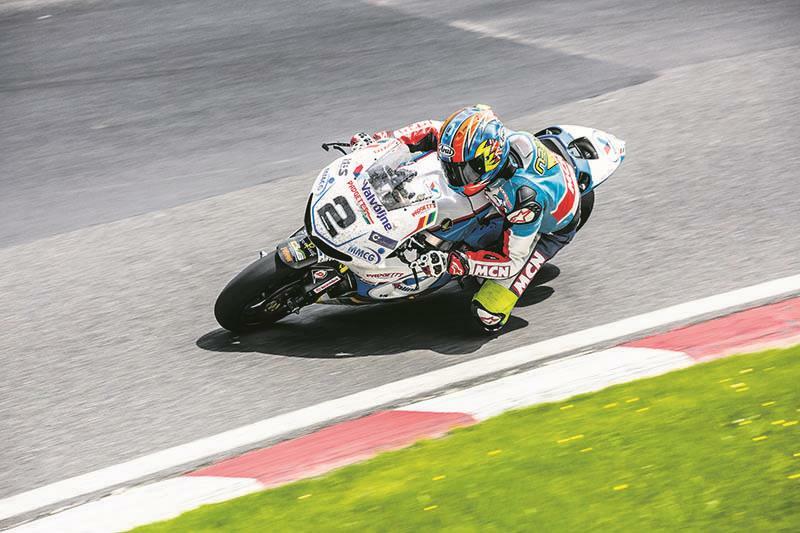 Like all the TT’s top riders, Anstey doesn’t like electronics interfering. His Honda spends so much time in the air they’d only get confused anyway. response and there’s the standard quickshifter, which lets Anstey slice joyfully through the standard HRC gearbox – taken from the open-class RCV1000R from a few years ago. There’s no autoblipper, though. Riding a racing RC213V-S might border on the spiritual and look just like Marc, Dani and Cal’s, but I have to keep reminding myself, this isn’t a factory MotoGP missile, but a road bike – albeit immaculately built, prepared and developed for the TT by Padgett’s of Batley. It has an electric start and I even have the remote Smart Key shoved down my leathers so it runs. Padgett’s mechanic Dave Castle, who’s brought the bike here, reckons at the TT the RCV took no more looking after than a trusty Fireblade. 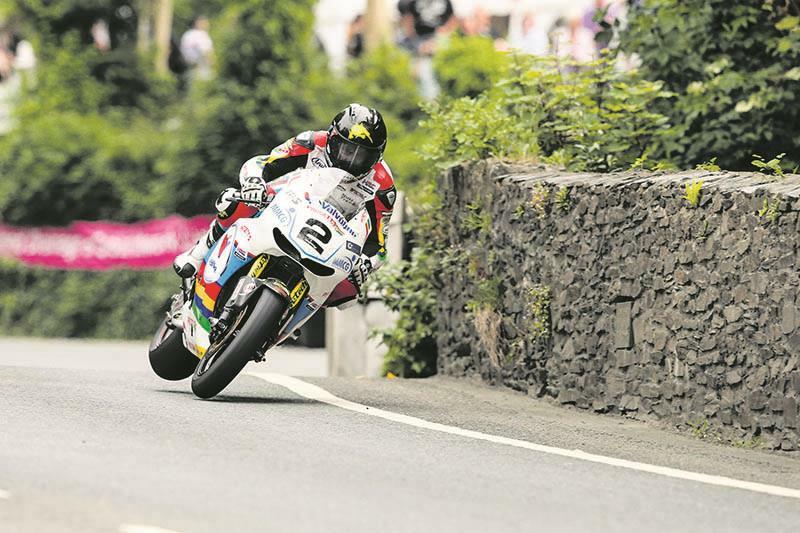 Anstey set a fastest lap of 131.595mph in the second lap of the Senior race and finished fifth, riding injured. That’s an impressive feat given that just a few weeks earlier this machine was an uncrated, bog stock £137,000 Honda RC213V-S road bike. Of course, to call a limited-edition thing of exquisite, hand-made beauty ‘bog stock’ is stretching it – it’s no mass-produced Blade, after all. The RC213V-S (S for street) is as close to a MotoGP bike as there’s ever likely to be. It won’t be Euro 4 compliant when the new noise and emissions arrive in 2017, so production stops at the end of the year, by which time only 200-odd bikes will have been made. Just like the RC213V MotoGP racer, the road bike’s chassis is fabricated by Moriwaki, assembled by HRC and the whole machine is put together in an exclusive, sectioned-off part of the Honda factory in Japan. The 999cc 90° V4 motor might not have the factory machine’s pneumatic valves or seamless gearshift, but it does have the same sand-cast aluminium crank cases, composite nickel-plated bores, camshafts, carbon fibre airbox, titanium conrods and valves. In standard trim, the RC213V-S makes 160bhp, which is peanuts compared to the current crop of road-going superbikes and not enough to battle against Hutchinson, Dunlop and McGuinness. But fit the £8000 Sports Kit, as Padgett’s have done, and things get a lot more interesting. The upgraded ECU unlocks more revs, the titanium race pipe unleashes more noise and, bang, you’ve got yourself 215bhp. With the RC213V-S at such a high level as standard, Padgett’s haven’t had to go overboard to transform it into a competitive TT racer. They spend more time and money race-prepping their Fireblade. 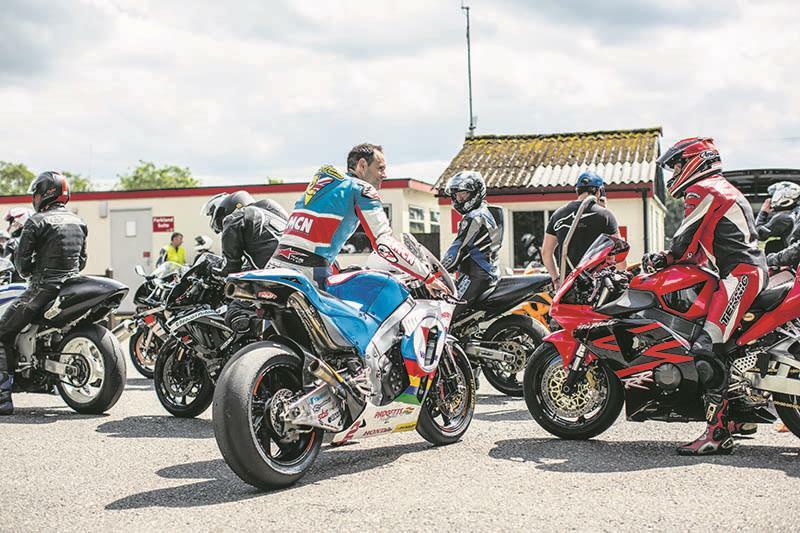 Engine, chassis, levers and footpegs are all left standard, but they’ve strengthened some of the brackets and fixings to cope with the stresses of the toughest track in the world. Without the time to test the RCV’s standard forks and brakes, they replaced them with Anstey’s favoured superbike K-Tech forks and race grade Brembos, which is as far away from standard as this RCV gets. The stock rear Öhlins shock is resprung and new racing OZ magnesium wheels are shod with Dunlop’s finest racing slicks. The Padgett’s RCV is the ultimate racing workhorse and is an extraordinary mix of ultra-exotic-meets-down-to-earth road racing. With the carbon bodywork kit removed it’s every inch the MotoGP bike and your eyes are treated to a riot of titanium and precision aluminium welding. It’s prepared to race-ready perfection. But fully dressed it’s TT-beaten and battle-scarred. It’s built for the rigours of the island. Fairing bolt-heads are secured with squares of five pound duct tape and a ’50s-style Monza fuel cap sits proud on top the tank, which looks so out of place on a MotoGP bike. The starter buttons are moved to the left bar, so peer into the cockpit and you’ll see the left switchgear cable-tied to the clock bracket. Race bikes look pretty in pictures but they’re menacing, scary creations in the flesh. The realisation they’re only built to lap a track as fast as possible is humbling when you get close. Self-doubt creeps in as you quickly realise you’re the weakest link in this equation, especially on a machine like this. Dave warms the Honda’s V4, before my allocated three laps and my pulse quickens on every blip of the ride-by-wire throttle. This 215bhp, 169kg racing machine sounds angry, looks angry and even has angry looking Dunlop slicks which won’t warm up properly in so few laps. There’s no traction control to bail me out if I get too giddy with the throttle, either. The sticky stench of race fuel adds a layer of seriousness to what I’m about to do, on a machine that’s already cut itself a slice of TT history. The RCV is exactly as Anstey raced it, except for the taller TT gearing (an extra tooth on the front, one fewer on the rear), which has been returned to standard for today. But even on stock sprockets the gearing is still long, especially first and I’m still slipping the clutch down the pitlane chute, past the circuit café as I join the circuit. Hairpin, Mansfield and the chicane are all taken in first gear, but remember, this is a machine designed for places like Phillip Island and Mugello. Cadwell is barely as wide as the service roads on most MotoGP tracks. Now we’re rolling, the RCV feels immediately natural. The thought of all that aggression, anger, power, noise and lightness made me shudder back in the paddock. I was expecting a stripped-down racing RCV to be a spiteful thing and a handful around Cadwell, but it’s the complete opposite. It’s docile, friendly – easy, even. Such is the V4’s honey smoothness and immaculate throttle response the RCV gives a warped impression of speed. It never feels that fast but you know it really, really is. There’s a sublime connection between your right wrist and the sticky shoulders of the Dunlop slicks and your never once miss the helping hand of electronics, or ever feel afraid. 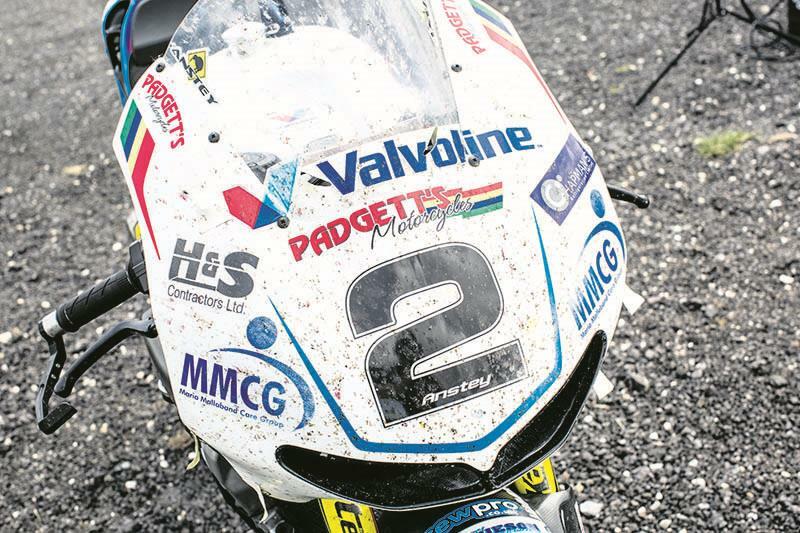 Anstey’s RCV weighed in at 169kg at the end of the Senior TT. That’s superbike-light when compared to a road-going 200kg-plus road sportsbike. But it’s not hollowed-out 157kg MotoGP-light, so the Padgett’s Honda has a sure-footed, planted feel to it around Cadwell’s majestic curves. 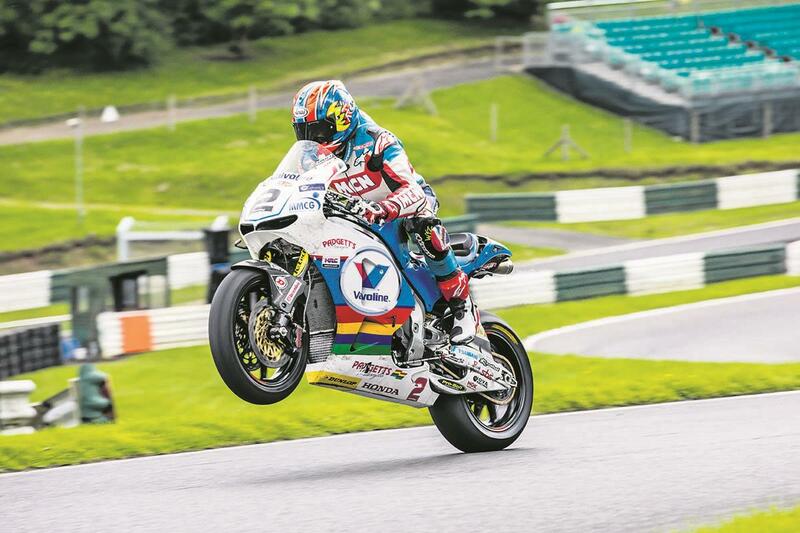 With such a chunky ali frame and heavily braced swingarm, you feel the heart of the RCV is stiff, but the K-Tech forks and Öhlins suspension are plush and controlled, turning Cadwell’s surface from hard tarmac to sublime, springboard velvet. With a 55mm longer wheelbase than a Fireblade, the RCV barely wheelies. It accelerates hard and flat, maximising all that the power on tap. It’s very stable, so max-lean corners are taken with absolute confidence. The steering is light, but nicely weighted and the Honda rolls smartly to your chosen apex every time. Quick changes of direction, like the TT's Gooseneck, are taken with little effort. With its standard six-way adjustable pegs set on their lowest, furthest-back position it’s comfy and roomy, too. No one thing sticks out as being remarkable about the Padgett’s RC213V-S, but, just like the best MotoGP bikes, it’s all about having everything work perfectly and progressively together. The RCV’s engine, chassis, brakes and tyres all collude in glorious harmony. You could probably ride a superbike just as fast as the RCV, but it would be a race-long fistfight and frazzle your brain. Even with such a limited amount of time on Anstey’s TT racer I feel at home immediately. Memories flood back from my time on the road and race-kitted RC213V-S I rode at the launch in Valencia last year. Now, just like then, it feels just like a modern-day RC30 – no wonder it took to the TT like a duck to water. But even those old 750cc V4s were mass-produced, built down to a price and not as special as the RC213V-S. The only full production sportsbike that comes anywhere near close to the feeling of the RCV nowadays is the brilliant V4 Aprilia RSV4 RF. My three laps pass too quickly and rolling back into the paddock I have a sense that Anstey’s RCV has spoiled sportsbikes for me forever. No bike will ever feel as good as this again. Bruce, you’re a lucky, lucky man. 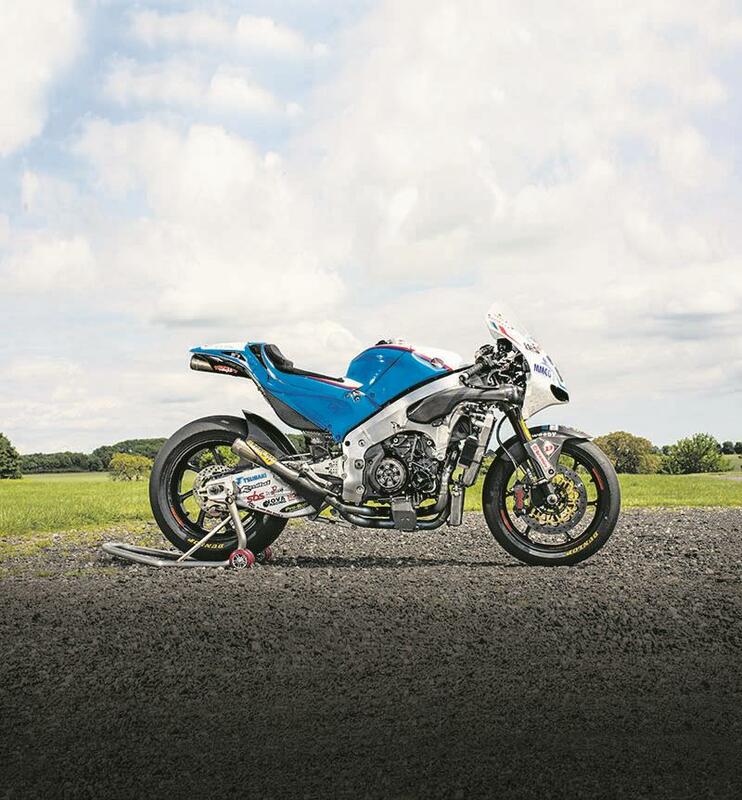 But all is not lost, because if you do want to buy the best sportsbike ever produced, Padgett's can help – they’re the only place in the world to actually have stock of them. And if you want one just like Anstey’s they’ll build you one of those, too. What a wonderful world we live in.